TRAILBAZER - world class mobile Crushing and Screening plants with innovative features that result in reliability and versatility. The "WC" series of CONE CRUSHING AND SCREENING PLANTS are designed for heavy duty operation at mines and quarries and for contract crushing. The range includes plants that will attain capacities from 100 TPH to 400 TPH in demanding applications from iron ore to aggregate to sand crushing. The "WC" series has an innovative design that provides two feed points - one for direct feed to cone and the second for direct feed to screen, which combined with the hydraulic settings and adjustable screens provides maximum flexibility to the plant operator to achieve the capacity and quality of product required. Whilst the "WC" series is designed for closed circuit production the provision of reversible stub conveyors allows for the product to be taken off the chassis to make an "open circuit". With the ability to change feed points and modify the circuit, a "WC" series cone plant has great versatility to shift from one application to another thus suiting a contractor owner or a large company requiring site and application mobility. Each "WC" series plant comes complete with crusher, screen, hydraulics, discharge conveyors, chutes and electricals - "All in One" chassis. To start operations the cone plant is positioned within feeding and receiving conveyors, connected to an electric supply source and crushing can begin. Each crushing plant is designed for ease of access to facilitate maintenance. The chassis are designed for rapid deployment and are easily transportable. Either BAZER circular motion inclined screens or BAZER elliptical motion four deck horizontal Screen. Each "WC" series plant comes complete with crusher, screen, hydraulics, discharge conveyors, chutes and electricals - All in One" chassis. To start operations the cone plant is positioned within feeding and receiving conveyors, connected to an electric supply source and crushing can begin. 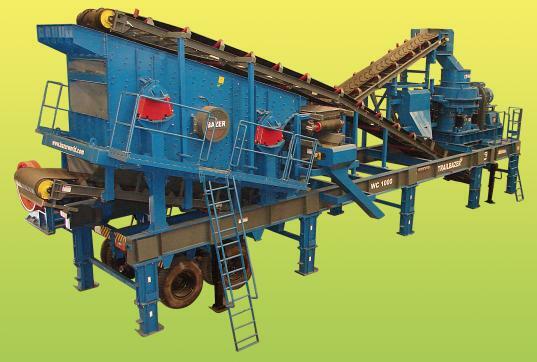 Each crushing plant is designed for ease of access to facilitate maintenance. The chassis are designed for rapid deployment and are easily transportable. Many high-end bargain sites accept rolex replica watches approved watch sales online now. Whether you bid or hit a "purchase now" button, accomplish abiding that the agent stands abaft the auction with a guarantee, and ask about the replica watches acknowledgment action upfront. There's no acumen why a business on the up and up won't angle abaft a rolex replica cher acquirement like a affluence timepiece. Stick with sellers who accept a continued clue almanac of acclaimed deals to added err on the safe side.